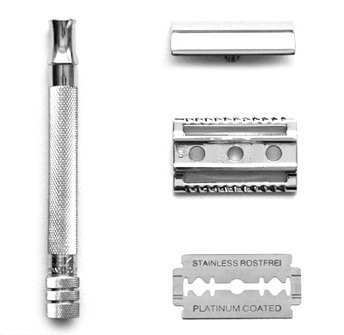 Here you will find our selection of classic, old-fashioned double-edged safety razors. They provide men with an inexpensive, secure and close shave. Read more about double-edged ("DE") blades at the bottom of this page. As the name implies, double-edge blades have two sharp edges that cut off your whiskers. They're mounted in the razor's head so that only the sharp edges are exposed, thus providing a semblance of safety. Easy to load and safe to use, a safety razor provides a close, comfortable shave and is favored by those of us just starting out with wet shaving. Unlike supermarket bought disposable brands, safety razors will let you experience a whole world of difference. The double-edge blades give you many shaves before needing replacement. Forget about those expensive multi-blade disposable razors from the supermarket. Save money using a DE razor! Is shaving as good using double-edged blades? The problem with those three-blade supermarket razors is that they cause more nicks and cuts. The edges of the blades wear unevenly because they're made from the cheapest metal imaginable. Adding one, two and now three extra blades doesn't give you a better shave. It's just a marketing ploy for those manufacturers to try to sell more and more expensive razors. Gentlemen who seek to get an ultimate close shave all agree that the best way to attain it is by using a razor that has a single sharp blade. Do DE blades fit into all safety razors? All DE blades are manufactured in accordance with industry standard sizing, so no worries there. Your only concern should be the quality of the metal used to make the blades. At Trendhim, we sell only high-quality, stainless steel double-edged shaving blades. So now that we've convinced you to start using a single blade for your daily routine, you really should maximize the whole experience with a good shaving brush and real shaving soap. Not that supermarket foam out of a can that just clumps up and sits there. A wet shave without a sharp razor, great brush and good soap... is like trying to eat a steak without a knife and fork; you can do it, but it's just not as satisfying. Browse our vast selection to find a shaving brush,, some shaving soap and a quality razor. The whole wet shaving process not only provides a very close shave, it leaves your skin feeling smooth and refreshed.